The first step to successful mouse control is to prevent them gaining access in the first place. 6mm is all a mouse needs to gain access to your home. I always consider the safety of children and pets as rodenticides are not only toxic to rats and mice. Mouse traps can be just as good to clear a mouse problem in fact more often than not when i deal with a mouse problem we only use traps. The traps and or bait is secured in tamper proof boxes in the areas where the mice are active (look for droppings) I continue baiting and or trapping until no further activity is noted this may take several weeks. At the end of the treatment I will remove the traps and or baits. as per the product label. Mice reach sexual maturity at around 35 days, pregnancy lasts around 20 days. 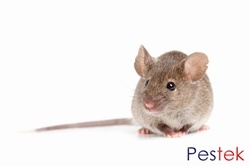 Mice can produce up to eight litters each year, with an average of 6 young per litter. Mice are carriers disease including salmonella so always ensure food prep surfaces are disinfected regularly why you have a problem and dispose of any open food packets that mice may have had access to. The house or domestic mouse generally spends its like indoors and will usually choose a dark area with little chance of being disturbed as a nesting site. Roof spaces and under floor cavities are the most common sites. Where there is little chance of being disturbed. Mice and or mouse dropping are usually first spotted in the kitchen. Access to the kitchen is usually though gaps around pipe work from the floor and under poorly fitted skirting boards.6mm is all the space a mouse needs to squeeze through. Mice eat pretty much anything, food crumbs and open packets make it much easier for them to find a meal. Field Mice are usually found outside however if access is available they are more than happy to live indoors. The usual access points into your home are through ground level air vents, gaps around pipe work, weep holes and under garage doors. Proofing your home during the summer in advance on a problem in the winter is advisable, fit mesh screens to air vents, proof weep holes and around pipe work with steel mesh.